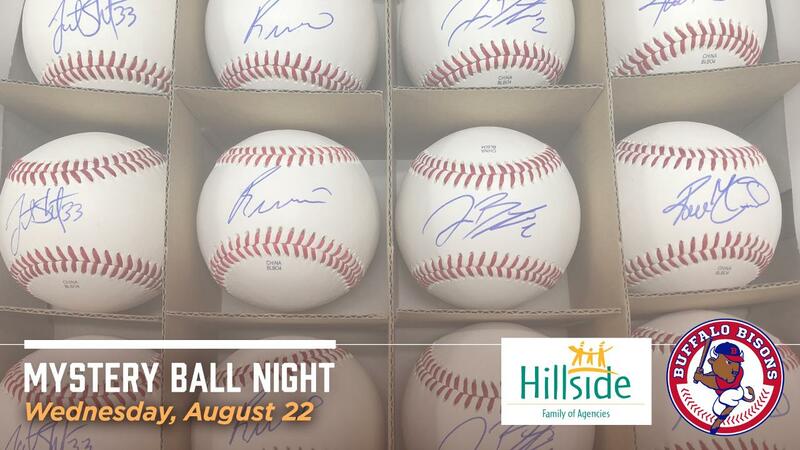 Home / autographs / baseball / Buffalo / Buffalo Bisons / CM / Daily Update / mystery ball night / Sports / List of autographs released for Bisons' "Mystery Ball Night" on August 22nd! List of autographs released for Bisons' "Mystery Ball Night" on August 22nd! BUFFALO, N.Y. -- Getting Vlad Guerrero Jr.'s autograph on a baseball is pretty special. Getting Rasmus Dahlin's signature on a ball? That's not only equally awesome, but also pretty unique. Ah, the beauty of the Bisons annual Mystery Ball Event. 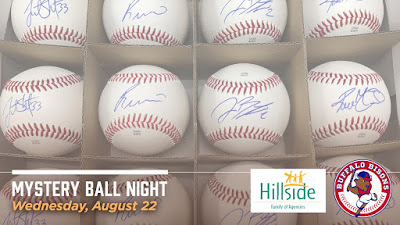 This fan-favorite event is back for an 11th year, Wednesday, August 22 to benefit the Hillside Family of Agency as the Bisons host the Scranton/Wilkes-Barre RailRiders at 7:05 p.m.
We've got autographs from not only the Bisons and Blue Jays, but also some of the biggest names in sports; Jack Eichel, Jim Kelly, Roberto Alomar, Aaron Judge, Jordan Poyer and Tom Seaver. The only question is… who are you going to get? Here's how the Mystery Ball works. Over the last year, we've collected over 500 autographed baseballs (complete list below) and will gift-wrap them before Wednesday to conceal their identity. Then, starting at 6:00 p.m., fans with game tickets can enter though the Oak St. Gate ONLY, and once inside, they will be given the opportunity to purchase one (1) Mystery Ball Ticket for a $20 donation to the Hillside Family of Agencies. Fans can then redeem that ticket for a gift-wrapped autographed baseball at the Mystery Ball table by Section 104 on the main level of the concourse at any time. Didn't get the one you wanted? Don't worry, we'll also have a trading station set up where you can meet with other Mystery Ballers and try to make a deal. Or, you can take all the mystery out of things by bidding one some great silent auction items, including a Josh Allen autographed football, a Vlad Guerrero Jr. signed jersey, a Jason Pominville signed stick and more. CLICK HERE for more information on this year's Mystery Ball event.